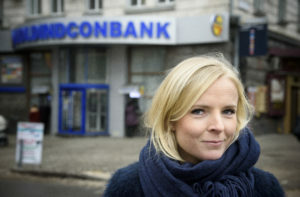 The €200 bn case of Denmark’s biggest lender Danske Bank showed, how cash from Russia and former Soviet states flushed effortlessly through the bank’s Estonian branch with no one paying attention to the close ties to the dictatorship in Azerbaijan, the FSB and members of the Putin family. Meanwhile the banks top management ignored warning after warning showcasing the problems. Important parts of the investigation were done in cross border collaboration with big and small media around the world. Jung will talk about the benefits of joining forces with colleagues such as the OCCRP. The story has had huge implications in Denmark and beyond. Authorities in several EU countries, the EU itself as well as the American Department of Justice and Securities and Exchange Commission are investigating. The stock dropped 13 bn € during 2018. The bank’s CEO, board director and handfuls of other in top positions in Denmark and Estonia has lost their jobs. And a similar case is developing these days in the Swedish bank Swedbank. Jung and her colleagues Simon Bendtsen and Michael Lund are nominated for the “European Press Prize” for their work. They have already received the “Investigation of the Year award” from the Danish Association of Investigative Journalism as well as the most prestigious Danish journalism award, The Cavling Award.